With its Northland shopping mall and its many suburban office parks on acres of asphalt, Southfield typifies the sprawling low-density suburbs of Detroit. It’s the sort of landscape that met the needs of businesses and residents leaving Detroit for suburbia a generation or two ago. But that car-dependent mode of development is increasingly falling out of favor as downtown-style walkable urbanism grows more popular. And Southfield, perhaps metro Detroit’s most prototypical suburb, is trying to reinvent itself. The focus is the City Centre, a varied district that stretches from the Southfield municipal offices and public library east of Evergreen between 10 Mile and 11 Mile roads west through a cluster of office parks and across Northwestern Highway to the Lawrence Technological University campus. A series of projects, public and private, are under way or in early planning that will make this Civic Centre denser and more pedestrian-friendly. The goal is to attract and retain some of thousands of daytime office workers who typically flee each evening to trendier living spots such as Ferndale and Birmingham. That’s especially important if Southfield wants to attract a younger demographic, said Jeremy Moss, 27, a Southfield City Council member and lifelong resident of the community. Terry Croad, Southfield’s director of planning, agreed. He noted that Southfield’s population of about 72,000 swells each workday to about 175,000 with office and commercial workers that the city would like to keep around. For starters, the City of Southfield has approved a $12.1-million reconstruction of the Evergreen corridor between 10 Mile and 11 Mile roads. Among the new features to come: Traffic-calming devices including two traffic circles or roundabouts, one at the entrance to municipal offices and the other at the entrance to the Southfield Public Library. Enhanced pedestrian crosswalks, bicycle paths, a landscaped median and other “walkable” amenities are on tap. Nearby, an older office building has been remade as Arbor Lofts, a residential project partially leased for students by Lawrence Tech. If demand warrants, more residential housing will be added where parking lots now exist. The city has also introduced sleek new bus stops, pedestrian benches, and even a new line of trash receptacles. Croad notes that everything within the broader Civic Centre project district is within a 10-minute walk of everything else. “We’ve got a lot of good bones,” he said. 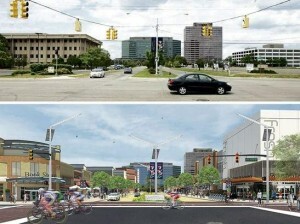 But the ambitions to remake Southfield’s core could go much further than a rebuilt Evergreen. The city commissioned a study by Robert Gibbs, a Birmingham-based planning consultant, who reported that Southfield could support hundreds of thousands of square feet of new retail, a new hotel, and more residential development. That finding led to a contract with studio[Ci], a design center founded by Constance Bodurow, a professor of architecture at Lawrence Tech. Bodurow’s studio produced elaborate designs showing how new retail and residential development could fill up the many surface parking lots that now dot the Civic Centre. Among her specific ideas: To deck over a portion of Northwestern Highway to create a pedestrian link between LTU’s campus to the west and the new mixed-use district to the east. And her plans calls for a new retail spine running between LTU and the municipal offices. “You’re making it really user-friendly but also really conducive to ground-level retail,” Bodurow said. Such ambitious plans depend on private developers stepping forward to make it all happen. But the remaking of Evergreen between 10 Mile and 11 Mile roads is a good start, Bodurow said. “That’s a major first step because investment in infrastructure drives private sector response,” she said. How much of the ambitious vision will actually happen? Earlier efforts at transforming soul-less suburban intersections into “downtowns” often failed because motor vehicles remained paramount. But the Southfield effort looks like the real deal — a broad-based plan that builds on existing strengths and that takes advantage of the latest knowledge in what pedestrians want and need.